Skills and Abilities: Skilled infiltrator and spy. Powers: Phayze has the ability to alter his molecular density so that his molecules can pass through those of other solid objects. In other words he can pass through solid objects. It’s assumed that Phayze is a bang baby who was present at the site of the original Big Bang. After receiving his powers he left Dakota unlike most of his kind and traveled the globe making a name for himself as a notable thief. He first appears infiltrating star labs to steal one of Hardware’s devices. An experimental machine which makes new water by combining Hydrogen and Oxygen, a seeming magic bullet for those living in the desert. At first he eludes Static because he has the ability to phase but he is eventually defeated and questioned by the hero. Upon explaining to static that he was stealing the device for an undisclosed sub-saharan country that paid him everything they had to steal it after paying him in advance. Touched by the gesture he decided to steal it for them despite them not paying his usual high fee [Static Shock #7]. 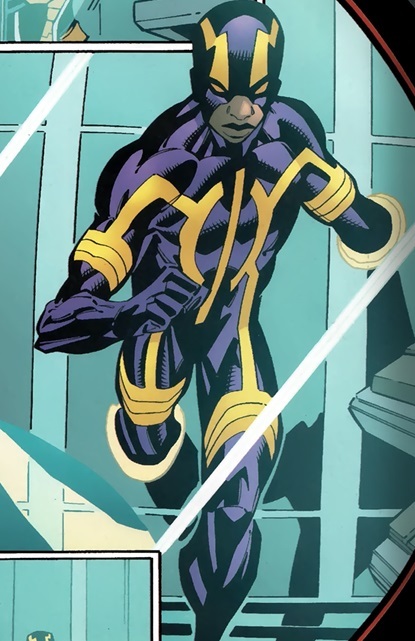 After Static had confirmation from Hardware he was allowed to keep the device granted he put an end to his villainy [Static Shock #7]. ← Extended Flash Trailer offers first look at Iris West and her Dad! Is it the same power with Kitty from the X-men ? I like this power : very useful when you have forgotten your keys and can’t get into your own apartment !